This Anasazi side-notched arrow point dates to the Pueblo III Period between A.D. 1100 and A.D. 1300. It was discovered during excavation of the Wallace Ruin site near Cortez, Colorado. 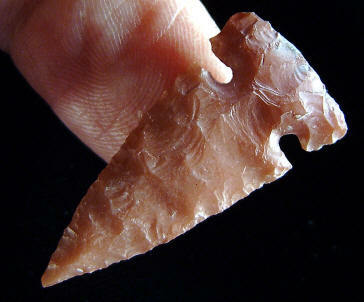 This side-notched point was made from a beautiful piece of red Jasper and it measures 1 5/16 inches (3.3 cm) long.